Joe Gillis (William Holden) is a struggling Hollywood screenwriter who is in a large amount of financial trouble. One day while trying to hide out from some creditors, he hides his car in the opened garage of what looks to be an unkempt mansion. He checks to see if the house is occupied, and it most certainly is. The house belongs to a wealthy former silent movie star named Norma Desmond (Gloria Swanson), who, at first, mistakes him for the man who was supposed to construct a coffin for her recently deceased chimpanzee. She soon discovers that he is a screenwriter and asks him to help turn a story she has written into a film, which will star her and her triumphant return to acting. Since he’s desperate for money, Joe agrees to help her. He is immediately persuaded to move in with her as the delusional former star takes care of all his finances. In doing so, she also grows overly attached to Joe. Joe starts to feel guilty and struggles to a find a way to break free from Norma’s grasp, and help bring her back to reality. Don't cross paths with Norma Desmond! All stars eventually fade, but some people have a hard time coming to terms with that. Norma Desmond, played brilliantly by Gloria Swanson, is a character who has had trouble coming to terms with this reality. She's a wealthy former silent film star that can buy whatever she wants, yet craves to return to the spotlight as she has been forgotten by a fickle audience. She is an eccentric at best and completely psychotic at worst. The first time she is on screen, she is trying to buy a casket for her dead pet chimpanzee. From there, she goes through a series of manic depressive and borderline suicidal tendencies as she swings from extreme highs to extreme lows and has regularly threatened to take her own life. We get the feeling she could still be in movies, if only she were willing to take supporting roles. Norma is not and will never be willing to be anything other than a leading lady since she is a little deluded in her star power and believes that supporting parts are beneath her. She is a ghost in a world that might not see her anyway, even if she were shouting on a street corner. William Holden is also very good as desperate hack of a screenwriter named Joe Gillis, who reluctantly takes advantage of Norma Desmond by writing a terrible screenplay for her and lives on her dime while doing so. He regularly feels bad about this, but is in such a bad position financially, he willing to put his morals aside. We also see great supporting performances from Erich von Stroheim, who plays Norma's servant Max Von Mayerling. He helps feed Norma's delusions as a way, in his mind, to protect her, as he has strong feelings for her. Nancy Olsen fills the role of Betty Schaefer, Joe's love interest. This casting is quite perfect and each actor plays off of one another in the most spectacular way. 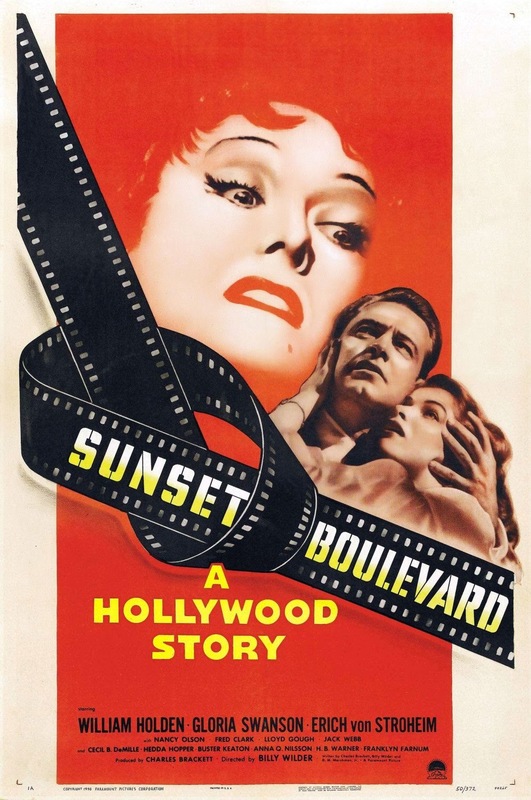 "Sunset Boulevard" is dark, tragic and engrossing film as the audience experiences the depression and madness of a once great actress. We witness the unfortunate events that spring up because of those around Norma who enable her fantasies and feed into what she thinks are accurate delusions of grandeur. This is still a great film even today that has held up very well as its overall theme of falling from Hollywood greatness transcends time. I want to see this. Thanks for a great review!